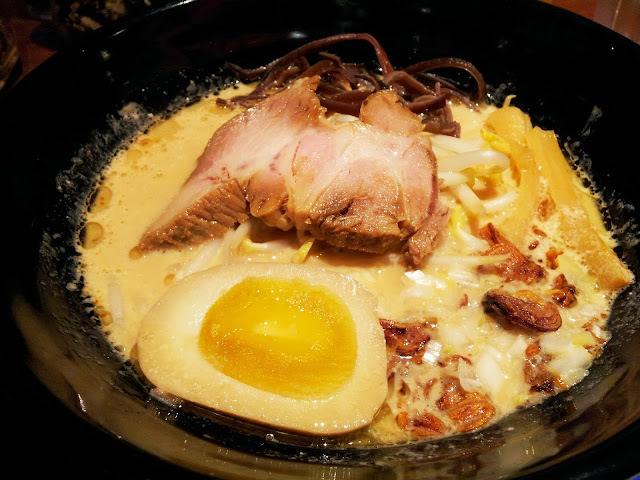 Tanjong Pagar is a trove for Japanese ramen places and Korean BBQ restaurants, but I'm not a huge fan of the latter so I decided to continue on with my hunt for the best ramen in Singapore. 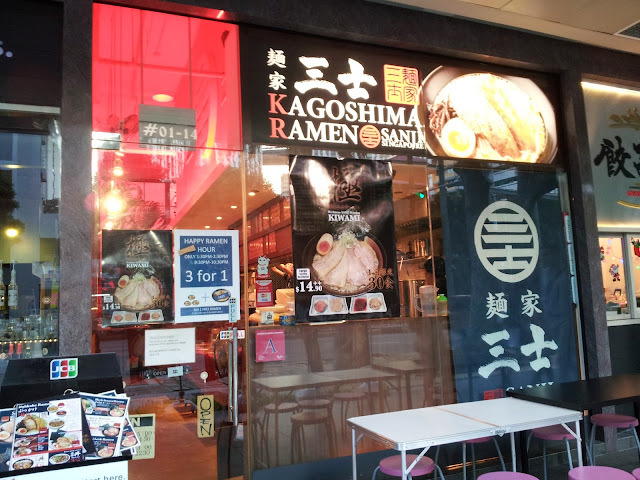 By the recommendation of a friend, I stopped by Menya Sanji Kagoshima Ramen! The first thing that I noticed was that the servers were really Japanese - their English was heavily accented by Japanese intonations that I was wondering if I was hearing Jap - I was deeply fascinated. 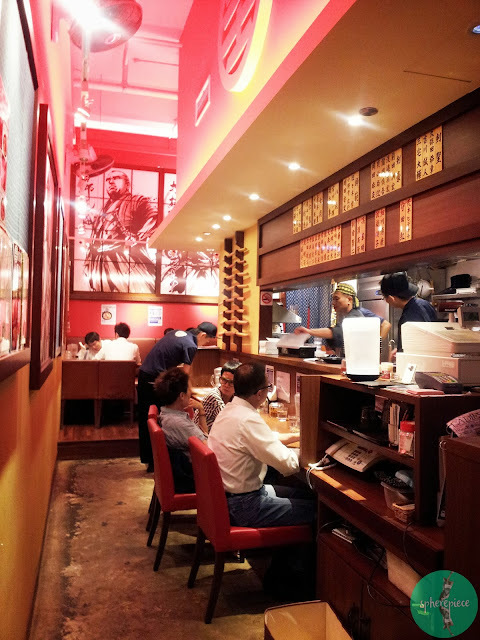 There were also a couple of Japanese businessmen tucked away and slurping away at their ramen happily, seems like a stamp of reassurance! 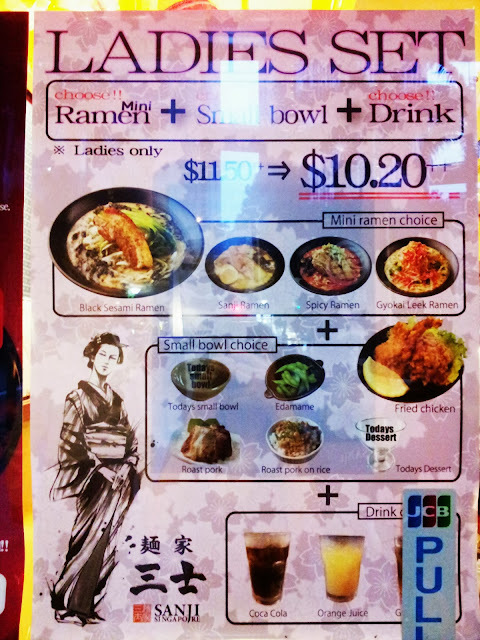 They had a Ladies Set available at $10.20++ which includes a mini Ramen (trust me, it's not thaaaat mini, the portion is just perfect to hit a good 65% - space for dessert: Black Sesami Ramen/Sanji Ramen/Spicy Ramen/Gyokai Leek Ramen) + Small Bowl Choice (Edamame/Roast Pork/Roast Pork on Rice/Fried Chicken/Dessert) + Drink (Coke/Orange Juice/Green Tea). I decided on the Sanji Ramen, Dessert (Cheesecake!) and Orange Juice. Sanji Ramen: The broth was really thicker than the usual sort and tasty too, but not too salty. The ramen noodles were also springy and very good - hardly anything to grumble about. The portion was supposed to be "mini" - but it is only slightly smaller, which meant more space for desserts. Taking into account its relatively lower price, Menya Sanji easily tops my ramen list beating big names Nantsuttei, Ippudo and Keisuke Tori King. 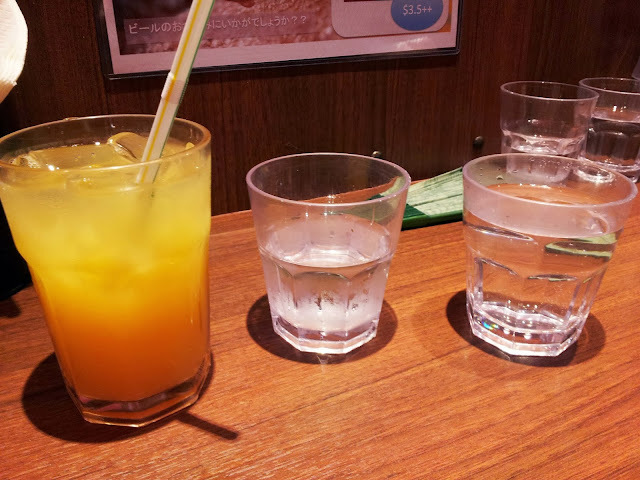 Orange Juice: Slightly diluted, but it's really quite cheap anyway. Cheesecake: I love how my cheesecake is served on a cold plate so that the temperature will maintain low as long as possible - really impressed by the attention to details. 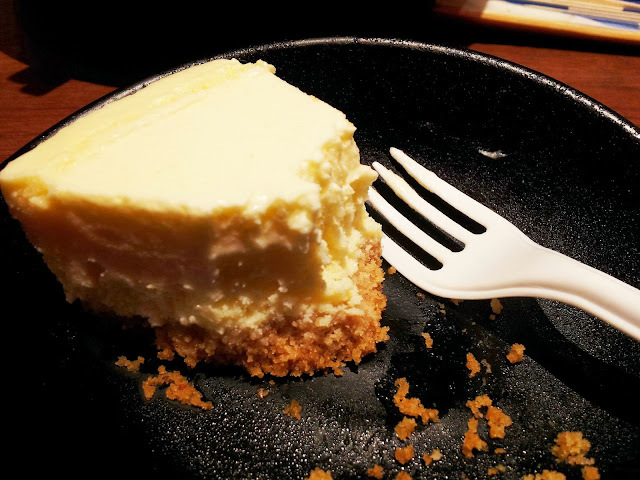 The cheesecake is also moist and dense at the same time, NOT cloying at all while being sweet! The biscuit crust at the bottom is also not too dry and crispy... all in all, I really love it. I might go back just for the cheesecake. The service is also double thumbs up, polite, prompt and responsive to requests, with a quiet sort of humour and grace. Definitely a place that I will return for.